What is the profile of a fund that has the odds stacked against it? For starters, “beta” index trackers that cover market capitalization-weighted indexes such as the S&P 500 may often lag their underlying index because of their fees, even though most of their expense ratios are tiny. Nevertheless, such funds may offer a better prospect than many active managers, who can’t get out of the way of their operating costs. Another fund manager who is against the wall is the “closet indexer”—the career risk manager. These strategists claim to be coming up with great investments, but when you look under the hood, their holdings look just like their competitors’ funds. Then there is the manager who actually has a lot of unique holdings but high fees. There is a fourth kind of manager who is not a market capitalization-weighted index strategist, a closet indexer or an expensive active manager. They have truly different holdings at digestible fees. We think WisdomTree’s quality dividend growth ETF suite is in this group. For example, three of the six WisdomTree Funds that we highlight here that screen for quality, earnings growth and dividends have at least 89%"active share," the proportion of their holdings that are different from their respective MSCI benchmarks. And since this is WisdomTree, they come with what we call Modern AlphaTM fee schedules. For an idea of just how bold such active share is, a cap-weighted strategy would target a figure of 0% because it is trying to be exactly like the S&P 500, MSCI EAFE or some other major index. A closet indexing strategy may clock in at 30% or 40%. One that is totally different, with no holdings in common with its asset class, would have 100% active share. A fund such as the WisdomTree International Quality Dividend Growth Fund (IQDG), which tracks the WisdomTree International Quality Dividend Growth Index, is 89% different from MSCI EAFE. Think about that. It’s the kind of fund designed to identify factors we think work—and then actually do something about it, rather than just quiver in the corner in fear of a bad year with some cap-weighted index. Now, put active share in the context of fees: Using simple arithmetic, we can calculate the “hurdle rate”—popularized by Martijn Cremers at Notre Dame—which quantifies how well the active selections need to perform to cover their expense ratios. This really matters in picking a fund or ETF. Path 1 is the worst. Sadly, trillions still sit in closet index funds that have low active share and high fees. Avoid these: Their existence is only justified if they somehow get past High hurdle rates. Path 2 isn’t much better. These money managers at least have high active share, so they have the courage of their convictions, but they trip over their high fees. Their hurdle rates are Average. Path 3 is a different breed, but just as bad as Path 2. These managers have low fees because they got the memo that the jig is up on huge expense ratios. But they are still closet indexing, hoping investors won’t notice their low active share. Their hurdle rates are Average. Path 4 is hard to find. 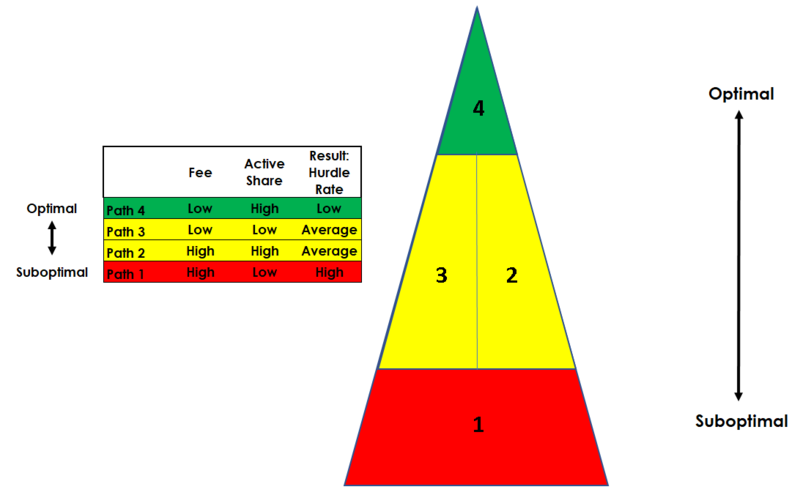 These are strategies that have both high active share and low fees. Their hurdle rates are Low—the sweet spot. Chances are good that a Path 4 fund is an ETF. I put this in visual form in figure 1. Figure 2 puts numbers to this concept, with hypothetical Path 1, 2 and 3 managers. Start with the Path 1 closet indexer. It has 35% active share, meaning the other 65% of its holdings are found in the cap-weighted benchmark. It charges 0.80%, so the unique holdings need to outperform by 229 basis points (bps) to match the market’s performance. That figure is found by dividing the expense ratio by the active share. It’s a big hurdle rate. The process repeats for Path 2 managers. A fund with 70% active share has the courage of its convictions, but this one is charging 1.00%. Its actively different picks must outperform by 143 bps for the fund’s return to match the market’s. Then we have the Path 3 closet indexer. Its hurdle rate is 100 bps despite its low fee. We think our quality dividend growth suite is the ideal Path 4. The ETFs have serious active share and small hurdle rates. If factor investing makes logical sense—and we think it does—the way to operate an ETF business is to have conviction and reasonable fees. That’s Path 4, and WisdomTree is in that business. There are risks associated with investing, including possible loss of principal. Foreign investing involves special risks, such as risk of loss from currency fluctuation or political or economic uncertainty. Heightened sector exposure increases a Fund’s vulnerability to any single economic, regulatory or other development impacting that sector. This may result in greater share price volatility. Dividends are not guaranteed, and a company currently paying dividends may cease paying dividends at any time. The Funds invest in the securities included in, or representative of, their respective Indexes regardless of their investment merit, and the Funds do not attempt to outperform an Index or take defensive positions in declining markets. Due to the investment strategy of a Fund, it may make higher capital gain distributions than other ETFs. Please read the Fund’s prospectus for specific details regarding the Fund’s risk profile.